Thelma was born on March 10, 1921 in Allendale, South Carolina to the late Norman and Viola Garvin. She and her brother, Norman Garvin Jr.(preceded her in death), were and raised by their grandparents, the late John and Caroline Jennings. 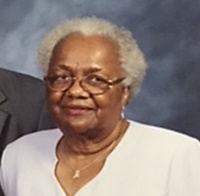 Thelma moved to Jacksonville, Florida in 1951, and was married to her late husband, Ernest B. Richardson, Sr.
Thelma professed her life to Christ at an early age. She fervently praised and worshipped the Lord. An earlier church affiliation in Jacksonville, Fl was with Union Community AME Church where she was an active member of the choir and the usher board. She became a faithful member of Bethel in the late seventies where she served as a member of the Deacons Ministry, the Sanctuary Choir, the Keenagers Ministry of Bethel Church, and the Live Long and Like It Club. Thelma loved reading her bible, praying for and with others, and spending time with family and friends. A loving mother and homemaker, she was a remarkable cook and enjoyed preparing meals for her family and friends, especially for holidays and Sunday dinner. Thelma cherished serving others in her community and in church. Thelma raised 6 children, elder and attorney, Edward W. Dawkins, Gloria Maree, Janice Zimmerman, Lelia Waters (Cheo), and Ernest B. Richardson, Jr. and Leon Eric Richardson (preceded her in death); 7 grandchildren, Curtis Dawkins (Laquana), Monique Samuels (John), Erika Sitzberger (Brandon), Erik Dawkins (Tonita), Willie Knight, Jr., Dr. Brandon Zimmerman, Bradford Zimmerman and David Richardson; 8 great grandchildren, SaNiya Samuels, Mackenzie Samuels, London Dawkins, Jelani Dawkins, Kai Dawkins, Moriyah Dawkins, Amber Sitzberger, and a host of nieces, nephews, cousins, relatives and friends. Her close relationship with Willie Knight Sr., Mrs. Jean Kruger and special relationship with Patty Dorsey will be forever esteemed. Her beautiful life will be cherished in the lives of her children, grandchildren and great grandchildren.